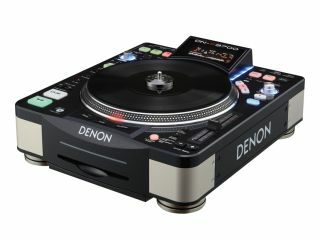 NAMM 2011 PRESS RELEASE: Denon DJ, a leading manufacturer of reliable, premium-grade DJ equipment, announces a major enhancement to its popular DN-S3700 Digital Media Turntable with the introduction of the new MIDI Hybrid mode via a free firmware update. Current users and future owners of the DN-S3700 will be able to use various supported DVS applications (on either a PC or Mac®) such as Serato™ Scratch Live, for direct spinning platter control using Denon DJ's world's-first built-in Relative mode timecode signal generator, in conjunction with the users' DVS-supported sound card or Denon DVS-supported mixers such as the DN-X1600 and DN-X600. This means that traditional CD timecode (and flash drive) media is no longer required for Relative mode operation because this required tone is generated inside the unit's DSP, and outputs through the analogue RCA connectors of the DN-S3700 during Hybrid mode. Various other surrounding keys and knobs are freely available to MIDI map as the user sees fit. Other firmware improvements with this release include new Auto BPM detection engine, doubled Platter Resolution and position accuracy via a newly added preset. With the addition of MIDI Hybrid mode, the DN-S3700 Digital Media Turntable is giving working DJs an even more comprehensive tool and solution they need to succeed and grow their creative talents. The DN-S3700 Direct Drive Turntable Media Player & Controller is a leading-edge single-deck portable DJ instrument that provides working DJs with a host of useful features for enhanced creative flexibility. Most notably, thanks to its large 9" spinning platter design, the DN-S3700 offers DJ's the best of both worlds from both digital and analog realms. In addition to a host of advanced digital features, including USB and MIDI control, the sleek and elegant unit includes a built-in authentic vinyl record for surface control driven by Denon DJ's High Torque Direct Drive Motor, providing users with the classic and unmistakable feel of true vinyl. In addition to its new 9" Spinning Platter Design and real vinyl record included, driven by a powerful Direct Drive Motor with torque adjustments, the DN-S3700 features a new sleek stylish and intuitive design with brushed aluminium corners and solid aluminium feet that will appeal to working DJs who want to look as good as they sound. Innovative new features include three Auto loops with real-time loop length adjust and loop trim capabilities. In addition, the attractive and easy-to-read new display adds visual waveform data to the mix, providing information on hot start, auto loop, and break point data. The DN-S3700's 9" platter mounted with real vinyl is constructed with an ultra high-resolution pulse sensor mechanism to accurately reproduce the subtlest or swiftest scratching movements made by the human hand. The platter can perform other vital functions too, such as pitch bending, frame searching and quick file navigation from external USB devices. For added creative flexibility, three "hot starts" can be made on the fly, which also double as auto loops. In addition to auto loops, traditional A-B loops can be manually executed on the opposite side of the player. And thanks to its built-in crystal clear DSP Effects, building the mood of the dance floor and remixing live has never been easier. DJs can easily activate and have full parameter control with a Dry/Wet mix control of the effects: Flanger, Filter (High-Mid-Low), Echo and Echo/Loop, as well as 3 Platter Effects, including Brake (adjustable in real-time), Dump (reverse sound without losing true forward time, like a radio edit) and Reverse (plays your music backwards). For those DJs who perform long mix transitions and require high pitch resolution, the S3700 offers pitch control via a 100-mm pitch slider with 0.02% for the ±6% pitch range and 0.05% for the ±10/16% pitch range. Wide ±100% range is also available. The innovative Denon DN-S3700 is also a "spinning" turntable-style MIDI Controller with Sound Card that gives users the advanced capability of controlling various DJ Mac/PC application software. The super-versatile and sophisticated DJ instrument lets users bring together and enjoy access to huge music libraries from virtually all existing storage media, including Apple® iPods® and USB Flash Drives. For total flexibility, it features an illuminated Slot-In CD Player, a quick-loading and fast data reading mechanism that offers a variety of audio compact disc support, including CD, CD-R, CD-RW and CD-TEXT. Thanks to its advanced External USB Device Support, users have access to vast portable music collections stored on external USB media and may connect their iPod, Thumb Drive, and large Hard Drives for easy access to small or extensive MP3/WAV libraries of up to 50,000 files. Users must simply plug these devices into the DN-S3700 to obtain the powerful on-board features, such as Instant Start, Seamless Looping, Effects, Scratching and easy File Searching, to name a few. Notably, with its MIDI Interface Controller (PC/Mac), the DN-S3700 is also designed to interface and control a variety of popular DJ programs that support USB MIDI in/out interface, either by user custom mapping or direct native support by the software vendor. Users can easily control their favorite DJ software all from a single advanced compact player. Unlike most dedicated DJ MIDI controllers that are only USB bus powered, the DN-S3700 encompasses its own internal power supply to achieve the highest electrical specifications, resulting in best possible performance. The DN-S3700 features industry leading Burr-Brown (a product of Texas Instruments) 24-bit DAC processing for superior output audio fidelity. The DN-S3700 comes complete with Denon DJ's acclaimed Music Manager Software. Among its groundbreaking features is a highly refined search system that lets users navigate and tag edit quickly through any MP3/WAV files connected to the system, with search criteria including Folder, Artist, Album, Title, Genre, Year, BPM and Playlists. The Music Manager will also auto calculate the BPM's for files as well as create the visual waveform data supported on the DN-S3700's display.